Researchers from Kanazawa University report in Journal of Neuroscience performed a microdialysis study on mice to determine mechanisms underlying the inflammatory response in the brain associated with fever that might be used to develop new strategies for treatment. The appearance of fever is associated with the release in the hypothalamus of a lipid compound called prostaglandin E2 (PGE2), which has an important role in the regulation of body temperature. However, how PGE2 is supplied to or maintain in the brain, and the role of membrane transporters (in particular of the prostaglandin transporter OATP2A1, encoded by the gene SLCO2A1) in this process still needs to be elucidated. To shed light on this question, Takeo Nakanishi at Kanazawa University, Japan, and colleagues performed a microdialysis study on mice, published in the Journal of Neuroscience. The researchers used mice with normal Slco2a1, with total Slco2a1 deficiency or with monocyte-/macrophage-specific Slco2a1 deficiency. They first injected the mice with physiological saline, observing the same body temperature for mice with and without SLCO2A1, indicating that the presence of OATP2A1 does not affect the basal body temperature. They then administered to the mice a pyrogen, lipopolysaccharide, that normally causes a fever. Indeed, mice with Slco2a1 developed a fever after 2h, whereas the pyrogenic effect of lipopolysaccharide was not observed in mice with total SLCO2A1 deficiency. They further demonstrate the body temperature of mice with monocyte-/macrophage-specific Slco2a1 deficiency was partially attenuated. Intriguingly, an inhibitor of OATP2A1 injected to the brain of rats with normal Slco2a1 inhibited the febrile response — in this case only an initial rise in body temperature was observed. The study reveals that the onset of fever is associated with increased PGE2 concentration in the hypothalamus interstitial fluid, but not in the cerebrospinal fluid, thus OATP2A1 seems to work by maintaining high levels of PGE2 in the hypothalamus, either by stimulating its secretion from glial cells in the hypothalamus and from brain capillary endothelial cells or by facilitating its transport through the blood-brain barrier. OATP2A1 seems to be involved in the secretion of PGE2 from macrophages, but OATP2A1 in cells other than macrophages may also contribute to the febrile response. This newly gained insight of the mechanisms underlying the inflammatory response in the brain associated with fever might be used to develop new strategies for treatment, pointing to OATP2A1 as a useful therapeutic target. Changes in body core temperature (A) and hypothalamic interstitial PGE2 concentration (B) in mice injected with lipopolysaccharide (LPS). LPS was intraperitoneally injected to Slco2a1+/+ or Slco2a1-/- mice at time 0 hr. Body temperature was measured by monitoring colonic temperature. For PGE2 measurements, samples were collected by means of microdialysis, and subjected to LC-MS/MS analysis. (A) and (B) show mean values ± S.E.M of 10 and 6 mice in each group, respectively. Immunofluorescence for Oatp2a1 in mice glial (left) and endothelial cells (right) in the brain. 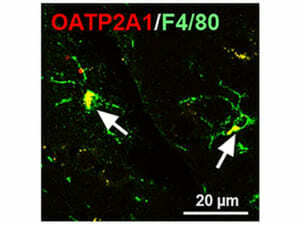 Immunoreactivity of Oatp2a1 (red color) was detected in F4/80-positive cells (e.g. microglia, green color) and in endothelial cells stained with CD34 (green color). White arrow indicates merge of fluorescence. This work was supported by Grants-in-Aid for Scientific Research (KAKENHI, 15H04755 and 15K15181) from the Japan Society for the Promotion of Science.